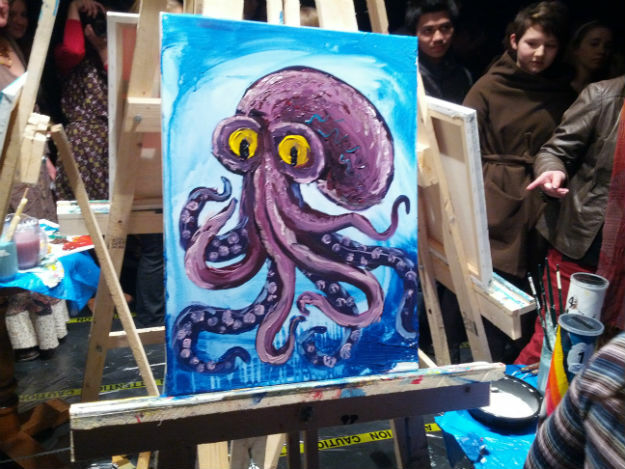 The countdown began on Friday night as an audience of about 100 spectators gathered in a circle and waited in anticipation for the annual Art Battle to begin. The four painters stood in the middle of the circle and were poised with paintbrushes in hand, palettes next to them and canvases in front placed on separate easels in a square. Doug Belding’s winning painting which he calls “a fashion girl”. 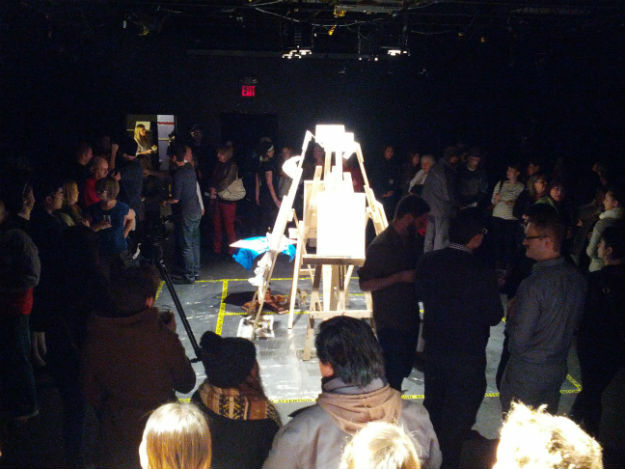 At the count of zero the music started up and the artists took to their canvases with fervour, gusto and speed. They had to complete their painting within a 20-minute timeframe and were not allowed to look at any photos — it all had to be created by memory and creativity. The spectators milled around the circle trying to absorb as much of the process from each painter as they could. 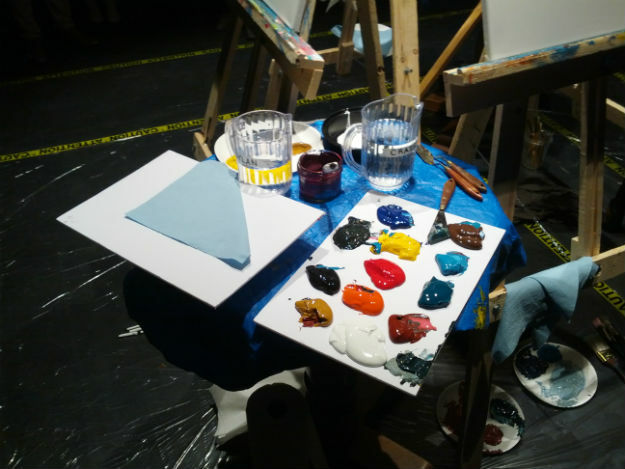 As the minutes ticked by, the myriad of shapes and cacophony of colours and textures began to come together and the artists’ thoughts suddenly appeared on canvas and were made visible to the audience. 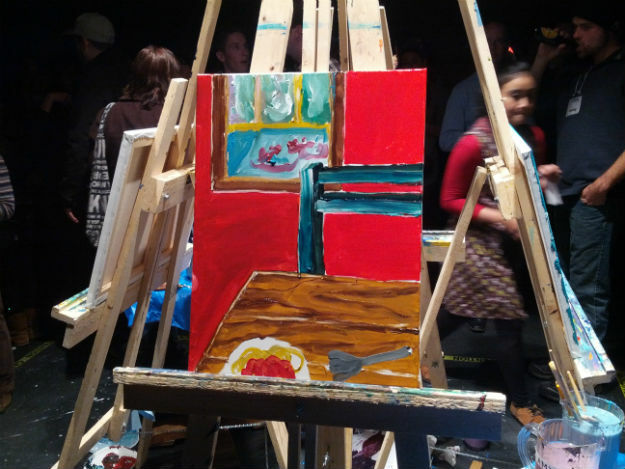 When the buzzer sounded, spectators voted for their favourite painting for this first round. The paintings depicted themes of Nova Scotia scenery, a rustic house in the wilderness, an octopus, and a colourful room with a plate of spaghetti on a dinner table. Molly MacLellan beginning her battle round. 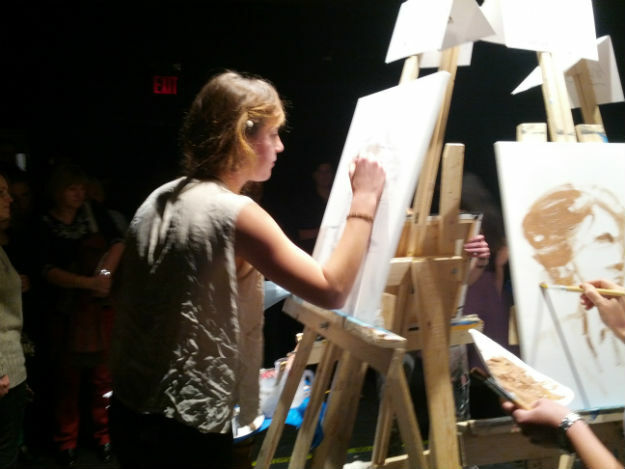 Erin Olejnik organized the Art Battle. Corey Strong almost done his painting. Such a large crowd--at least 100 people! 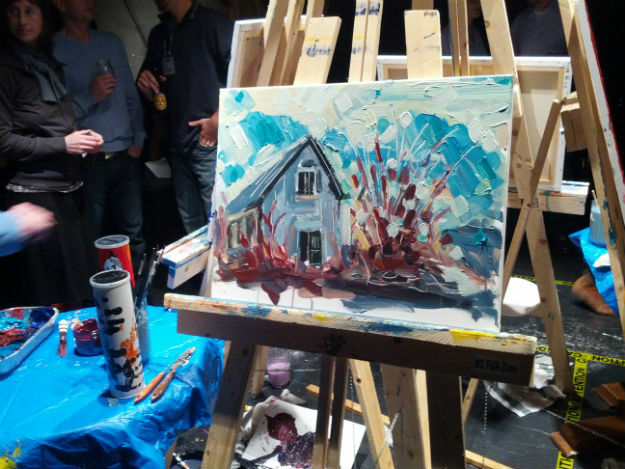 Corey Strong's completed art: Nova Scotia scenery. Voting time! Which is your favourite painting? 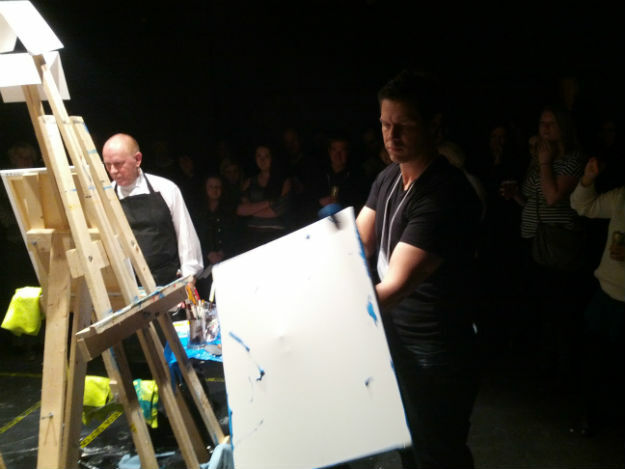 Doug Belding getting his canvas ready. 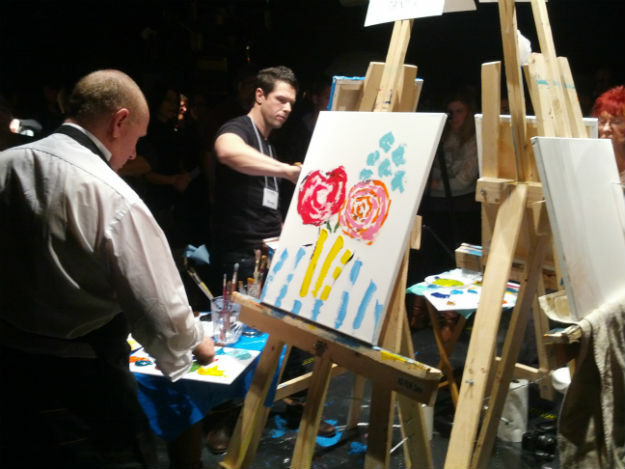 Extreme focus and precision with the palette knives. 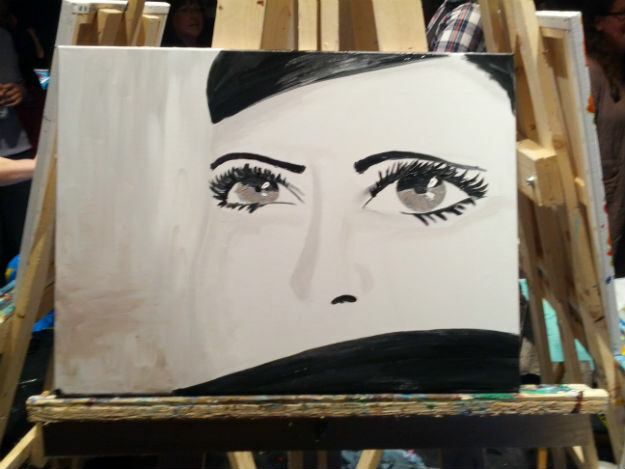 Doug Belding's finished painting from round two: a Japanese woman in a Kimono. Some of the contenders studied at art schools, others never received instruction in the arts but honed their skills independently. 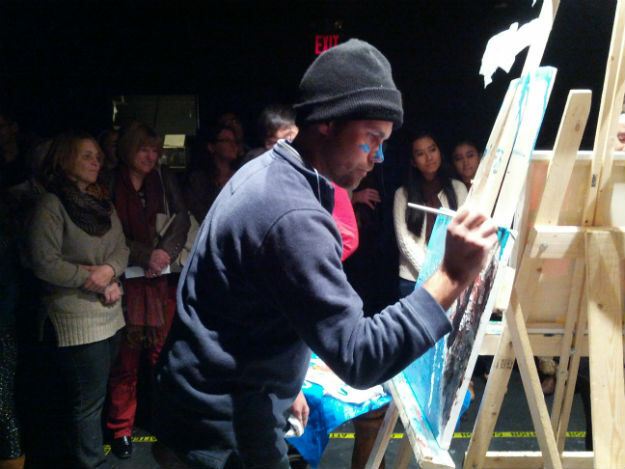 Corey Strong, a contender in the first round of the competition, had volunteered in Tanzania, teaching painting to disadvantaged youth. “These 18-year-old homeless guys (had) such talent,” he said. 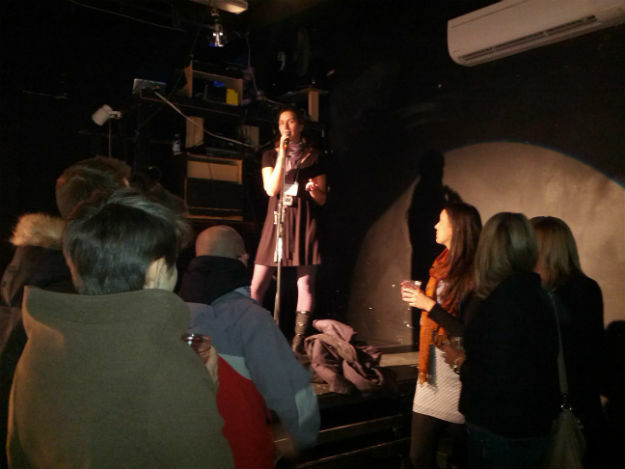 “So when I returned to Halifax I picked it up again after a 10-year absence from it,” said Strong. 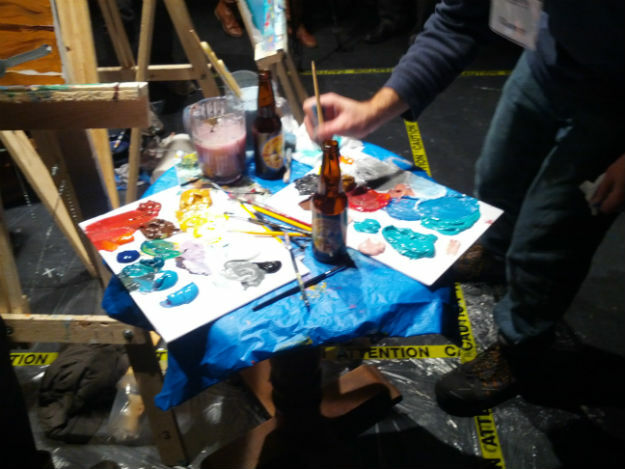 “Doing a painting in 20 minutes — it’s an adventure, it’s a challenge,” said Ken Ward, a participant in the second battle, with a chuckle. 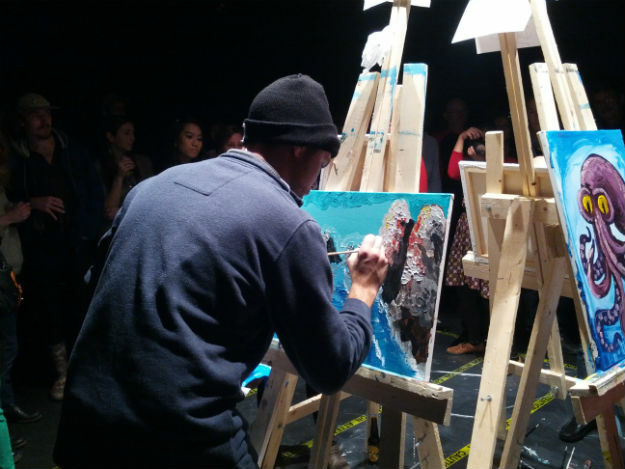 The second round went to Doug Belding, who painted a Japanese woman in a colourful kimono dress with his unique style of painting with palette knives as opposed to paintbrushes. 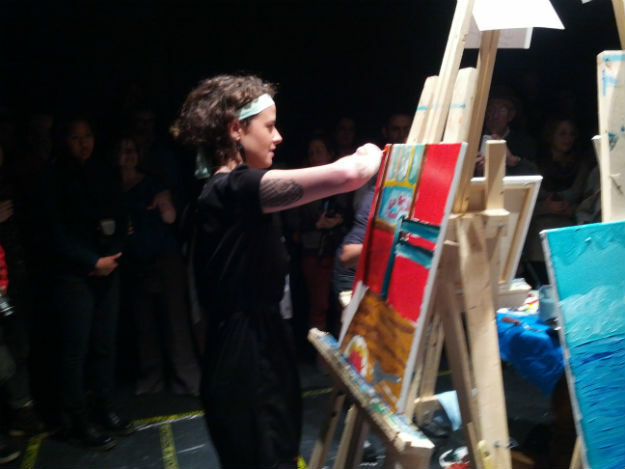 “The cool thing about this competition is people get to see the process that not many are privy to because most painters hide in their basement,” said Belding. 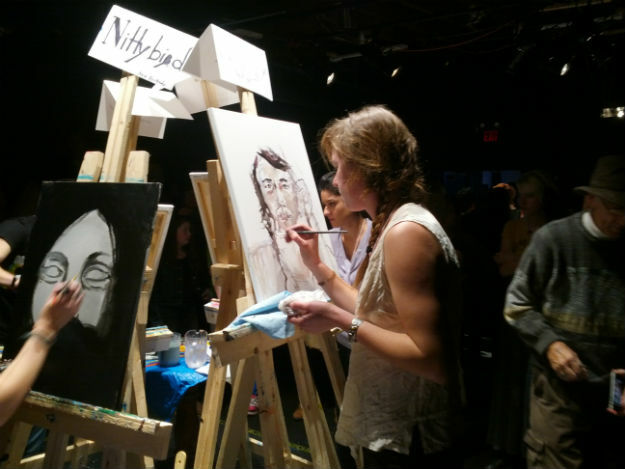 Molly MacLellan, a third-year student at Nova Scotia College of Art & Design University, was new to the event. As the third round began, MacLellan’s dad eagerly watched among the other spectators. 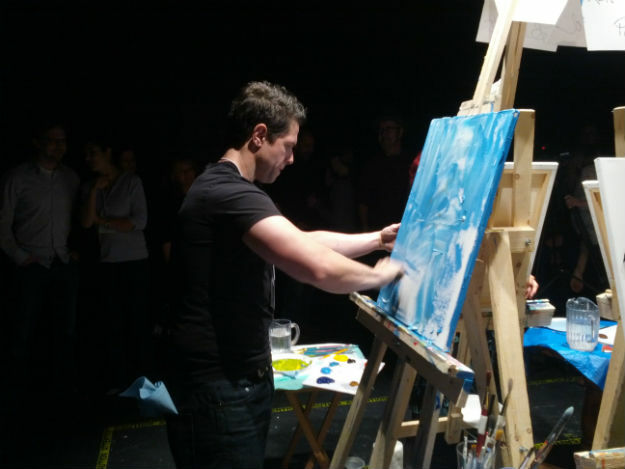 “She phoned me up and told me she was going to be doing this and I really enjoy it because she really loves art and she’s really comfortable being an artist and I think it’s cool for someone to challenge themselves like this,” said Paul MacLellan. The third round went to Nitty Bird, who painted a pale lady with emerald-green eyes framed by raven-black hair with scarlet-red roses in her hands. 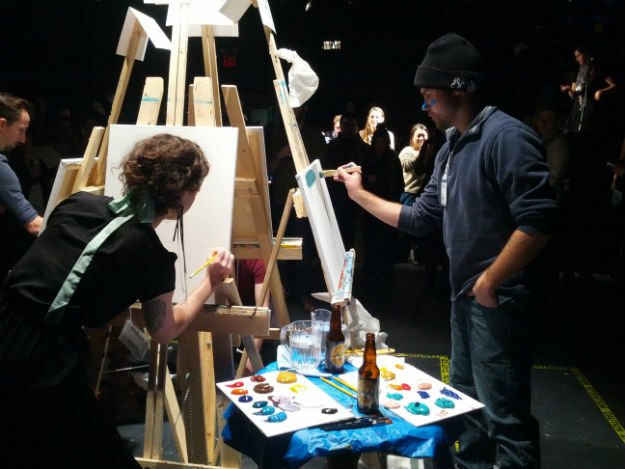 For the final battle, one easel was taken away to leave only three in a triangular formation for the final competitors: Craig Baltzer, Doug Belding and Nitty Bird. 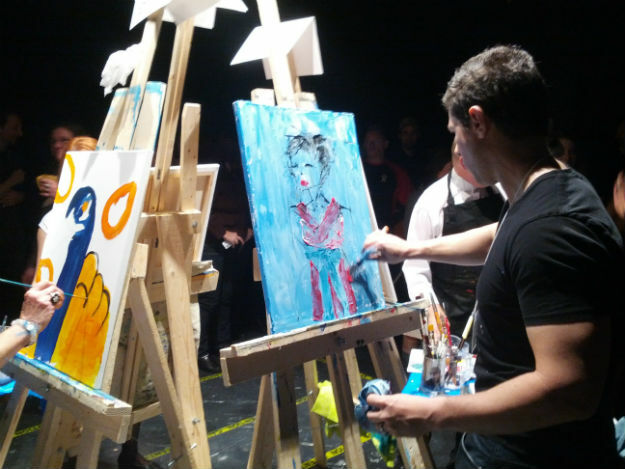 Belding displayed raw finesse and ease as he took his canvas off the easel and began by painting the outer edges and covering the canvas with a solid sheen of colour. “It all comes down to a person’s technique,” Belding commented. Belding ended up winning the battle — and a $250 prize. 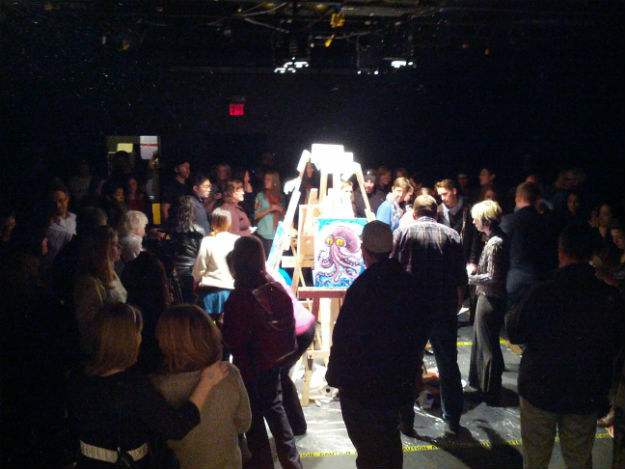 Then all paintings from the night were auctioned off in a silent auction in which audience members were to bid a minimum of $50. There were hugs, cheers and handshakes among all contestants. 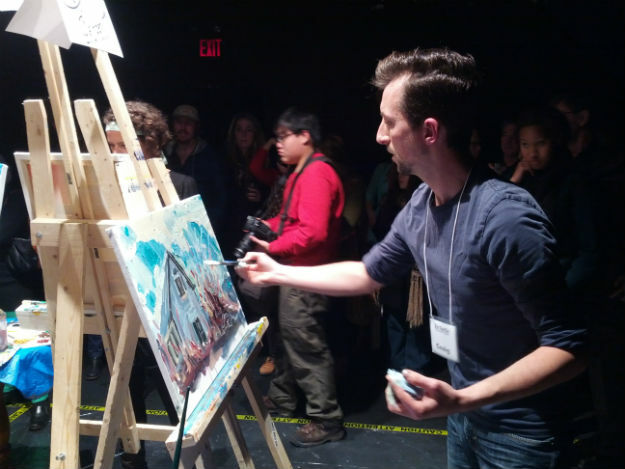 “This is a really enjoyable event and calling it ‘Art Battle’ is a bit of a strange title because everyone is quite loving and supportive — it’s like a community,” said Belding who also won Art Battle in New Brunswick last year, which placed him among the finalists at the national event in Toronto, Ont. This year, Belding will battle in the second Halifax finals in 2014 before he can move on to Toronto.